For more information and contact please visit the SCHWARZ LAB. 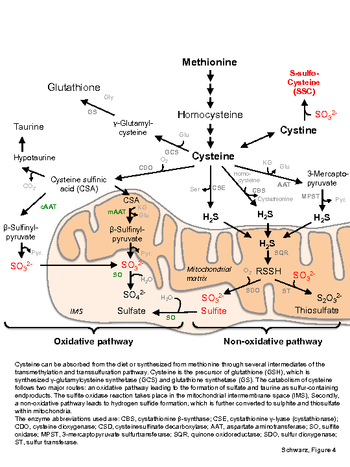 Sulphite oxidase (SO) is a molybdenum enzyme in the intermembrane space of mitochondria, which catalyses the terminal step in oxidative cysteine catabolism. A loss in SO function results in severe neurodegeneration, which we found to rely on NMDA receptor-mediated excitotoxicity as well as sulphite-induced mitochondrial dysfunction. Here, we aim to clarify the cellular organisation of cysteine catabolism and understand the integrations of SO in mitochondrial respiration. We will further provide a mechanistic understanding how sulphite, which accumulates in SO deficiency, impacts glutathione and H2S homestasis, both of which being crucial for mitochondrial regulation of cellular functions. Kumar, A. Dejanovic, B., Hetsch, F., Semtner, M., Fusca, D., Arjune, S., Santamaria-Araujo, J.A., Winkelmann, A., Ayton, S., Bush, A.I., Kloppenburg, P., Meier, J.C., Schwarz, G., and Belaidi, A.A. (2017). S-sulfocysteine/NMDA receptor-dependent signaling underlies neurodegeneration in molybdenum cofactor deficiency. J. Clin. Invest. 127, 4365-4378.